This exciting candlelit evening includes a 3 Course traditional Irish Dinner, Lots of Irish storytelling & humour about the history of Parkgate Street and the Phoenix Park, Live Traditional Music & Singing by our well-known Irish Band, along with professional Celtic Dancing and Sean-Nós Brush Dancing. Guests are seated together in a relaxed friendly environment which allows them to get to know each other and share stories between them of their experience of Ireland so far. This is a unique, authentic and memorable night for everyone involved. 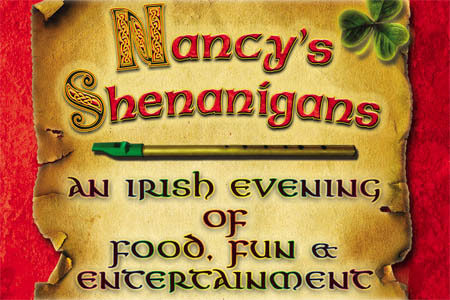 Also includes a LIVE Guinness bread-making demonstration along with a flaming Irish Coffee Demonstration completed by the owner of Nancy Hands himself. We encourage guests to tap-a-long, sing-a-long or dance-a-long as much as they please on this night! This is an Intimate and Engaging Evening which seats max 50 guests at a time- so Booking is Essential! Please See Our Trip Advisor & Facebook Page for More Reviews on One of the Best Traditional Irish Shows in Dublin! Also featured on the Dublin Visitor Centre Website as one of the Top Things to Do in Dublin and as a ‘Hidden Gem’ in the City.